Fox Valley Mall in suburban Aurora was shut down temporarily due to a large fight Monday night, a security official told NBC 5. Videos surfacing on social media appeared to show a large crowd and police responding en masse to the suburban shopping center. Police said six people were in custody in relation to the incident Monday night, but it was unclear if they would be charged with anything. Yareli Vargas works at the mall in the food court and saw much of the commotion. “There was a bunch of kids fighting and the security guards were trying to break them up,” she told NBC 5. Vargas said stores started closing as the tussle ensued. “They all started running upstairs away from the cops and some of them were fighting the cops and then they evacuated everybody out here," she said. 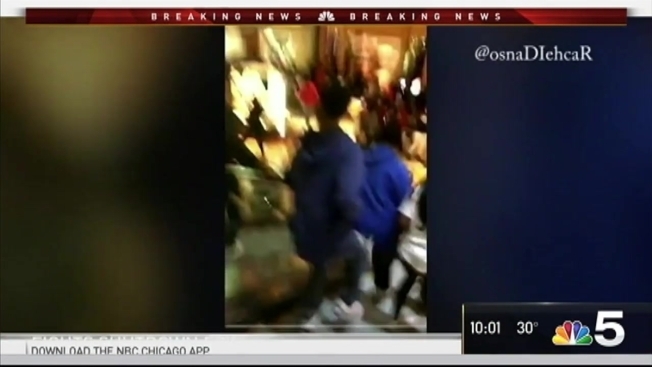 Twitter users reported a large fight at the mall. Video from the scene show frantic people running down escalators, police attempting to break up a large crowd and a large amount of police cars responding the scene. Similar incidents have been reported at malls across the country from New York to Ohio.